Tucson Daily Photo ~: Tucson Rodeo Turns 90! 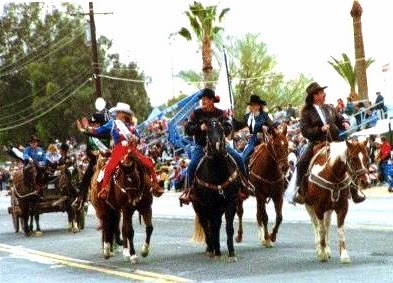 In Tucson the annual rodeo (La Fiesta de los Vaqueros) is a really big event. And this year it celebrates its 90th birthday! Long celebrated as the world's longest non-motorized parade, this is a sight to see with floats, buggies, dancers, bands, and riders. It's Tucson's equivalent of New Orleans' Mardi Gras! The rodeo spans 9 days and schools are closed for 2 days. Yes, Tucson schools close for rodeo! Ah, yes, good memories of gorgeous horses and superb riding! Love that they still give the school kids 2 rodeo days off from school :) The funniest thing is what follows directly after the very last parade entry....the street sweepers...But they're not picking up confetti, haha!! Who was the Grand Marshal this year? Jerry Kindall, former UA basketball coach is this year's GM. I remember getting the days off from school. Though, I only watched the parade on TV. Is it still broadcast? BTW, Jerry Kindall was the baseball coach. I only remember because I was attending college there while his teams were winning the college world series. Kathy (from snowy Boston)-Was in Tucson last week. We were entertained by the warm clothes being worn while we were in shorts and t-shirts.